A 77-year-old obese Caucasian male presented to the emergency department (ED) with a sudden onset of lower chest and epigastric pain and collapse after lifting a heavy object while working on his ranch. Per his wife, the patient was a previously healthy and active individual who had recently lose fifty pounds with diet and exercise. The patient had a past medical history of gastroesophageal reflux disease (GERD), hyperlipidemia, diabetes, and hypertension. He was a smoker from age fifteen to sixty, stopping seventeen years ago. The patient also had a history of alcohol abuse, but had been sober since the mid-1970s. On arrival to the ED, the patient was alert, but somnolent, pale, and in moderate distress. His vital signs on initial presentation were: blood pressure of 94/72 mmHg, heart rate of 89 beats per minute, and respiratory rate of 16 breaths per minute. His abdomen was distended but soft, with moderate epigastric tenderness and no rebound or guarding. No pulsatile mass was palpated. An electrocardiogram (EKG) showed sinus rhythm with no acute ST changes and a right bundle branch block, which was present on a previous EKG. The patient’s initial complete blood count (CBC) demonstrated a white blood cell count of 24.0 x109/L, hemoglobin of 11,000 g/L, platelet count of 198 x109/L, and a left shift (93% neutrophils). The comprehensive metabolic panel (CMP) was unremarkable. Creatine phosphokinase (CPK) and troponin were normal. Amylase and lipase were normal. 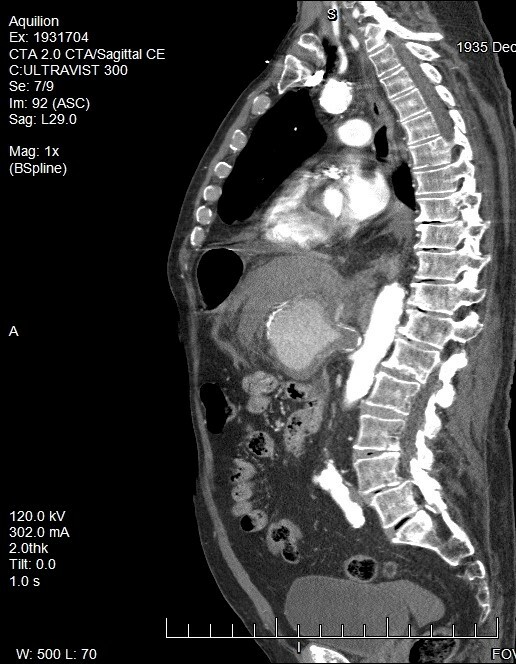 The patient underwent a computed tomography angiogram (CTA) of the chest and abdomen, which showed an 8.0 x 6.0 x 6.5 cm aneurysm in the location of the celiac artery and splenic artery with extensive fat stranding, representing active hemorrhage. Within thirty minutes of arrival to the ED, the patient went into presumed hypovolemic shock with hypotension (59/34 mmHg), tachycardia (142 beats per minute), and tachypnea (26 breaths per minute). The patient was taken to the operating room (OR) within forty-five minutes of arrival to undergo a ligation of the neck of the aneurysm. Upon arrival to the intensive care unit (ICU), the patient went into cardiac arrest, and was pronounced dead after unsuccessful resuscitative attempts. Visceral artery aneurysms (VAA) are those affecting the celiac, superior, or inferior mesenteric arteries and their branches. These aneurysms are uncommon compared to aortic or iliac aneurysms. Splenic (60%), hepatic (20%), superior mesenteric (5.9%) and celiac (4%) are the most common arteries affected. These aneurysms have an incidence rate between 0.1% and 2%, and a high rupture rate (25%). Twenty-two percent of them present as clinical emergencies, with a 70% mortality rate. This patient had an aneurysm affecting both the celiac and splenic arteries. These aneurysms are usually symptomatic at the time of diagnosis, but can be asymptomatic as well. The most common symptom is epigastric pain, but there can also be associated nausea, hematochezia, hematemesis. On exam, there may be abdominal tenderness, distension, or a palpable pulsatile mass. The exact etiology of celiac aneurysms is unknown, but they are frequently associated with arteriosclerosis, medial degeneration, fibrous dysplasia, syphilis, tuberculosis, trauma, or mycotic lesions. Approximately 42% are idiopathic in nature. The risk of rupture for celiac aneurysms is about 13%. Ruptured celiac artery aneurysms have a mortality rate of approximately 80%, while non-ruptured aneurysms mortality rate ranges from 5-10%. Risk factors for rupture include pregnancy and increased diameter (>20mm). Early diagnosis is crucial, as the emergency operative mortality rate is 40%, while the elective repair mortality rate is 5%. Criteria for intervention in asymptomatic patients include: aneurysms greater than 2 cm in diameter with sensible operative risk, radiologic evidence of increasing aneurysm size, or a size greater than 3 to 4 times the original diameter of the vessel. Splenic artery aneurysms (SAA) are found four times more often in females than in males, and occur most commonly in patients in their fifth or sixth decades of life. Autopsy studies indicate an incidence of SAA between 0.1% and 10.4%. The reported rate of rupture is between 3% and 9.6%, with a mortality of 36% after rupture. The exact etiology of SAA is unknown, but they are frequently seen in association with portal hypertension, pregnancy, multiparity, atherosclerosis, hypertension, liver transplantation, and cirrhosis. Eighty percent of these aneurysms are found to have atherosclerotic changes and calcification. Incidence of rupture is seen most frequently in young, pregnant women, with an associated maternal mortality of 75% and a fetal mortality of 95%.Patients with unruptured splenic artery aneurysms are commonly asymptomatic, and are often diagnosed incidentally. The most common clinical complaint is epigastric abdominal pain, but patients can also experience a palpable pulsatile mass, hematochezia, melena, chest pain, or nausea. Hepatic artery aneurysms have a mortality rate of 40%. They have an incidence rate of 0.02– 4.0%, as well as a rupture rate of 80%. Hepatic artery aneurysms are associated with chronic occlusive disease, mycotic embolization, trauma, Marfan syndrome, Klippel-Trenaunay syndrome and giant cell arteritis. Ninety percent of hepatic aneurysms are singular, and 60-70% are located outside of the liver. Patients with aneurysms from nonatherosclerotic etiology are at higher risk of rupture. Patients with hepatic aneurysms are commonly seen to develop other visceral aneurysms. Fifty-five percent of these patients present with abdominal pain, and gastrointestinal hemorrhage occurs in up to 46% of patients. Patients can also present with jaundice. Surgical treatment is recommended when the aneurysm reaches >20.0 mm. Patients with superior mesenteric artery (SMA) aneurysms are usually symptomatic, most commonly presenting with intermittent abdominal pain. These aneurysms often have mural thrombosis, which may ultimately result in acute mesenteric ischemia. SMA aneurysms can also invade into adjacent visceral organs, resulting in severe hemorrhage. SMA aneurysms are associated with higher dissection rates than the other visceral artery aneurysms, but only have a reported incidence of 0.06%. The rate of rupture for SMA aneurysms is 50%, where initial presentation includes hypovolemic shock, hemoperitoneum, or acute abdominal pain. These lesions are associated with high mortality rates during emergency surgery (20-40%). Risk factors include arteriosclerosis, septic emboli, pancreatitis, connective tissue disease, and trauma. It is important to quickly diagnose and treat these aneurysms to prevent serious complications including gastrointestinal or intraperitoneal hemorrhage, thrombosis, distal embolization, arterial spasm, arteriovenous fistula formation, secondary portal hypertension, bowel infarction, and death. General indications for treatment of VAA include presence of pseudoaneurysm, symptomatic VAA, asymptomatic VAA >2cm, rapid expansion (>0.5cm per year), pregnancy, women of childbearing age, or liver transplantation. When approaching a patient with signs of abdominal vascular catastrophe, differential diagnosis should include visceral as well as aortic aneurysms. VAA are often not suspected initially in patients presenting with abdominal complaints, given their low prevalence, which can delay diagnosis. These patients can also present with clinical symptoms and signs that are fairly nonspecific. Consequently, these commonly present with life-threatening hemorrhage. One can get a good idea of which vessel is involved based on presentation and patient background, but imaging is needed to confirm the diagnosis. Due to their high rate of rupture, the typical approach to VAA is early elective intervention rather than watchful waiting. 1. Arabia R, Pellicanò S, Siciliani R, Dattola OL, Giusti S, Terra L. Splenic artery aneurysm and portal hypertension. Report of a case. Minerva Med. 1999 Apr; 90(4):143-5. 2. Ferrero E, Ferri M, Viazzo A, et al. Visceral artery aneurysms, an experience on 32 cases in a single center: treatment from surgery to multilayer stent. Ann Vasc Surg. 2011; 25(7): 923-35. 4. Shanley C, Shah NL, Messina LM. Common splanchnic artery aneurysms: splenic, hepatic, and celiac. Ann Vasc Sur. 1996; 10(3): 315-22. 5. Saliou C, Kassab M, Duteille F. Aneurysm of the coeliac artery., Cardiovasc Surg. 1996; 4(4): 552-5. 6. Gupta R, Khanna SK, Chaudhary A, et al. Coeliac artery aneurysm: a case report. Cardiovasc Surg 1996; 4(4): 550-2. 7. Syed M, Shaikh A, NeravetJournal of the Royal Society of Medicinea S. Celiac artery aneurysm embolization by coil occlusion. Ann Vasc Surg 2005; 19(1): 113-9. 8. Kenningham R, Hershman MJ, McWilliam RG, Cambell RF. Incidental splenic artery aneurysm. J Royal Soc Med 2005;95: 460-1. 9. Stanley JC, Fry WC. Pathogenesis and clinical significance of splenic artery aneurisms. Surgery1974;76:898-909. 10. Dave SP, Reis ED, Hossain A, et al. Splenic artery aneurysm in the 1990s. Ann Vasc Surg 2001; 14(3): 223-9. 11. Gehlen J, Heeren P, Verhagen PF, Peppelenbosch AG. Visceral artery aneurysms. Vasc and Endovasc Surg 2012; 45(8): 681-7. 12. Bueschel P, Meyer F, Weber M, et al. Rare aneurysm of the hepatic artery with overlap to the gastroduodenal artery in very uncommon coincidence with occurence of hepatomesenteric trunk. Wien Klin Wochenschr. 2003;125(3-4):111-4. 13. Kobayashi Y, Iwasa M, Sugimoto R, et al. Education and imaging. 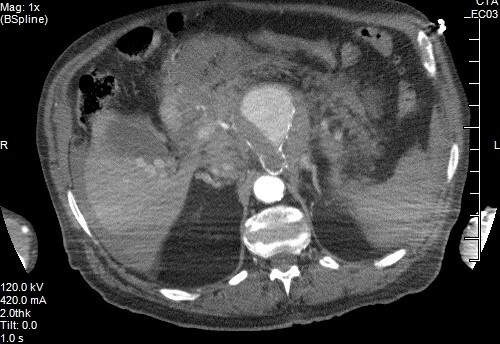 hepatobiliary and pancreatic: Duodenal bleeding from a hepatic artery aneurysm. J Gastroenterol Hepatol 2013 08;28(8):1256. 14. Rebonato A, Rossi M, Rebonato S, et al. Giant hepatic artery aneurysm: a fatal evolution. J Emerg Med 2013;45(6):212-4. 15. Schweigert M, Adamus R, Stadlhuber RJ, Stein HJ. Endovascular stent-graft repair of a symptomatic superior mesenteric artery aneurysm. Ann Vasc Surg 2011;25(6):841.e5-8. 16. Luan JY, Li X. Computed tomography imaging features and classification of isolated dissection of the superior mesenteric artery. Eur J Vasc Endovasc Surg 2013;46(2):232-5. 17. Olsen AB, Ralhan T, Harris JH, Evani V. Superior mesenteric artery pseudoaneurysm after blunt abdominal trauma. Ann Vasc Surg 2013;27(5):674-8. 18. 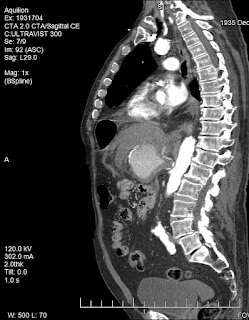 Choo C, Yen H. Unusual upper gastrointestinal bleeding: ruptured superior mesenteric artery aneurysm in rheumatoid arthritis. World J Gastroenterol 2013;19(28):4630-2.